Bayside Mall, formerly the Sarnia Eaton Centre, on a Saturday morning in 2013. Most stores are vacant or occupied by non-profits or independent businesses. The Toronto Eaton Centre, large, famous, and vital, is only one of many malls built in the downtown cores of Ontario cities between the 1960s and 1990s. From Thunder Bay to Cornwall, the construction of new enclosed shopping centres were seen as a necessary tool to keep the old city centres vibrant and relevant in the face of competition from new suburban malls. But only in the province’s two largest cities did the concept work. Elsewhere, these urban shopping complexes were left largely vacant within ten years of opening, when leases expired. When the Eaton’s department chain went bankrupt in 1997, huge voids were left behind that developers and municipalities struggled to fill. The Toronto Eaton Centre was opened in two phases between 1977 and 1979. It added hundreds of shops and new office space to Downtown Toronto, anchored by a new Eaton’s flagship and was connected to the Simpson’s store across Queen Street. Today, the Eaton Centre is Canada’s second largest mall (including the Hudson’s Bay/Saks Fifth Avenue building) and the Toronto region’s second most productive shopping centre in terms of sales per square metre. In Ottawa, the downtown Rideau Centre, opened in 1983, is the busiest and most productive mall in that region (Retail Council of Canada, 2016). But elsewhere in Ontario, downtown malls — mostly built with municipal and/or provincial government support — have been, without exception, commercial and urban development failures. Not only did they suffer from high vacancy rates, they helped to wreck the downtown cores they are located in rather than foster the economic revitalization they once promised. Through the 1950s, downtown was the only place to shop. Just about every city had at least one department store. Toronto had the flagship Eaton’s and Simpson’s stores at Yonge and Queen, Hamilton had Eaton’s, The Right House, and Robinson’s, London had Eaton’s, Simpson’s and Kingsmill’s. Even Kitchener had Goudies to rival the local Eaton’s branch. Every city and larger town also had a Woolworth’s, a Zeller’s, and a Kresge’s. Ontario’s first major shopping mall opened in Hamilton in 1954. The Greater Hamilton Shopping Centre, later renamed Centre Mall, was built in the east end of the city on the site of a former race track. It was anchored by Simpsons-Sears (the first full sized Sears store in Ontario) and Morgan’s (which later became part of the Hudson’s Bay empire). Eaton’s firmly stayed put in downtown Hamilton. Since then, suburban malls have proliferated across Canada, following their core market of young, middle class families. Suburban malls not only offered convenience and selection, rivaling downtown cores, they also offered easy highway access and large, free parking lots. Eaton’s itself eventually joined the rush, building a new mall where Highway 401 was to meet the planned Spadina Expressway. Today, despite the loss of Eaton’s, Yorkdale Shopping Centre is Canada’s most productive mall, expanding several times, and attracting luxury retailers. As downtowns across Ontario (and North America, for that matter) lost retail market share to the suburbs, new high-speed roadways and urban renewal were seen as the answer. It was thought that new downtown shopping malls and parking garages would help retain business being lost to the suburbs. In many cases, senior levels of government were determined to help. 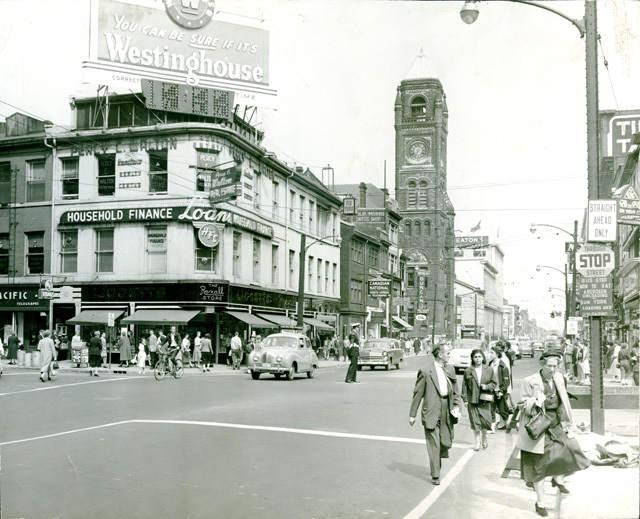 The corner of James and King Streets, Downtown Hamilton c. 1960. Note the clocktower of the old Hamilton City Hall at centre, and behind, the old Hamilton Eaton’s store. Most of the buildings seen here were demolished to make way for Jackson Square and the Hamilton Eaton Centre between the 1960s and the 1980s. Image via Hamilton Public Library. In Hamilton, a massive downtown urban renewal project in the 1960s and 1970s saw over a dozen city blocks cleared for new commercial and civic buildings. The centrepiece was Jackson Square, a mall with over 200 stores and services with a rooftop patio. Connected to the mall were the Eaton’s store (later redeveloped as Hamilton Eaton Centre), a new central library, two office towers, a hotel, and a new farmer’s market building. The first phase of Jackson Square opened in 1972. Kitchener soon followed Hamilton’s example, demolishing its own city hall (the clock tower now stands in Victoria Park) for Market Square, which opened in 1974. Eaton’s moved down the street into the new shopping centre. Sudbury’s City Centre was a similar municipally-backed project to revitalize its downtown core; Eaton’s opened there in 1975. The pace of downtown mall openings quickened in the late 1970s and 1980s as the provincial government provided assistance through the Ontario Downtown Redevelopment Program. From Thunder Bay to Cornwall, the province backed over a dozen mall developments, and more often than not, Eaton’s was the lead anchor. The smallest downtown mall to open was in Tillsonburg, whose population was only 11,000 in the 1980s. Sears only anchored three downtown malls built in this era, in Chatham, Cornwall, and Kitchener’s King Centre. Ontario’s downtown malls, including the successful Toronto Eaton Centre and Rideau Centre. Malls that were anchored by Eaton’s are marked by blue pegs. The last malls to open under this scheme were the London Galleria, which opened in 1989 as a major expansion to Eaton’s Wellington Square (and included a new Bay department store), and Hamilton Eaton Centre, a postmodern atrium connected to Jackson Square that opened in 1990. The postmodern Hamilton Eaton Centre, attached to Jackson Square, was opened just in time for the early 1990s recession. But instead of helping to revitalize tired mid-sized downtowns, most of these malls quickly failed. At first, retailers once located on busy downtown streetfronts moved into the malls, accelerating the visible decline outside the mall. Malls themselves were designed with blank walls facing the main street, as illustrated in Chatham. Such architecture did little to welcome new patronage. Downtown Chatham Centre: like most downtown malls, this building does a poor job meeting the urban street. Most customers enter through the parking lot and garage at the rear. Many cities, like Brantford, Sarnia, and Hamilton were hit hard by deindustrialization. Hamilton Eaton Centre opened just in time for the 1990-1993 recession [Filion and Hammond]. In Brantford, the gigantic Massey-Harris and Cockshutt farm equipment factories closed as free trade agreements came into effect. Municipalities were often required to build large parking garages to support the downtown malls and used parking charges to finance the costs of construction. Suburban malls offered free parking and were more conveniently located to where most people live and worked. Many major retail chains attracted to new malls left as soon as their initial leases expired. In 1997, before Eaton’s closed its Brantford store, Shoppers Drug Mart and National Bank were the only national retailers left in that downtown mall (McQueen, 1998, p. 257). The final blow for many of these malls came when Eaton’s declared bankruptcy in 1997. As part of its hoped-for recovery, the chain planned to close dozens of its poorest-performing stores, including all of its downtown locations in Ontario, aside from those in Toronto and Ottawa. Brantford is one of twenty-one money losing-stores that will close over the next twelve months. Stores in Brantford, Sarnia, Guelph, and Peterborough were all opened in the early 1980s as part of a wrong-headed Ontario-government experiment that drew Eaton’s in to help revitalize downtown urban cores that had been disemboweled by suburban malls. The idea was a miserable failure, another situation where Eaton’s paid little heed to the fact that there was no business case to the strategy it decided to follow. The four cities still owe almost $40 million because loan repayment was to the based on profits that never materialized (McQueen, 1998, p. 257). In Chatham and Cornwall, downtown malls anchored by Sears Canada fared better, at least in the short-term. Neither city had major suburban shopping centres to compete with. But the rise of big-box shopping centres, online shopping, and stagnant economic growth in both cities (which both lost major industrial employers) eventually hurt them too. Sears converted both those department stores into outlets before Sears Canada itself declared bankruptcy and ended retail operations at the end of 2017. In Toronto and Ottawa, the concentration of downtown office workers, robust public transit systems, and tourist traffic helped to ensure the viability of their downtown shopping centres. Toronto Eaton Centre is connected to two subway stations, while the Rideau Centre is connected to Ottawa’s Transitway and its nearly-completed LRT line. The former Eaton’s stores, later acquired by Sears Canada, are now Nordstroms. New downtown residential development has also helped a strong retail market in those two cities. Some downtown malls, like Hamilton’s Jackson Square, have managed to adapt. Despite the loss of many national retailers, Jackson Square remains busy, especially on weekdays; it has a renovated food court and a new supermarket, Nations, to provide it with the anchor it sorely lacked. As Downtown Hamilton sees new investment and residents, Jackson Square will be well equipped to serve the local market. The City of Hamilton has taken over much of the former Eaton Centre as municipal office space. In Peterborough, the Eaton’s store is now a Galaxy Cinemas, which complements the bars and restaurants in that city’s downtown core. At the other extreme, the City of Guelph purchased its Eaton Centre in 1998, demolishing or rebuilding most of it. The Eaton’s store was replaced by the Sleeman Centre, an arena hosting an OHL junior hockey team and concerts. Most of the remaining mall was rebuilt as Old Quebec Street, designed to look like the original downtown street the mall was built upon. Keskus Mall in Thunder Bay was also demolished and replaced by a casino. In other cities, like Sudbury, London, and Peterborough, former Eaton’s-anchored malls continue to survive, but are now largely dependent on government offices, educational institutions and non-profit agencies to fill empty space. The former Bay department store in London, closed in 2000, now houses the central library branch. In Brantford, Wilfrid Laurier University purchased the mostly vacant mall to expand its campus there; and in Sarnia, there are now plans to build a retirement home in the largely vacant Bayside Mall. And with the closure of Sears Canada, Cornwall Square and Downtown Chatham Centre must now decide how to adapt. Chatham’s downtown mall will get a Hart discount department store, but it will fill a space much smaller than the vacated Sears location. Like Sarnia, neither Cornwall nor Chatham has a major educational institution looking to expand or healthy population growth that could provide a quick and useful turnaround. Filion, P. and Hammond, K. (2006 Winter). “The Failure of Shopping Malls as a Tool of Downtown Revitalization in Mid-Size Urban Areas.” Plan Magazine, 49-52. This entry was posted in Development, History, Ontario, Urban Planning and tagged Brantford, Chatham, Cornwall, Dead Mall, Downtown, Eaton's, Guelph, Hamilton, Kitchener, London, Ontario, Peterborough, Retail, Sarnia, Shopping, Sudbury, Thunder Bay, Tillsonburg, Waterloo. Bookmark the permalink. I believe CBC Radio’s new London station is also within the confines of the old London Galleria. It is! It’s next to the library, facing Dundas Street. Very insightful article, Sean. As always, well researched and written with a tone of compassion and reasoned optimism. Thanks! Galt’s downtown mall has nothing commercial in it except for an Engineering office. Don’t ever remember it having anything successful. When it opened there was a Dominion store, a restaurant, some clothing stores and an LCBO. They were all pretty much gone in a very short time. Most locals probably don’t even remember it having anything resembling a shopping centre. I sort of remember Galt’s little mall, but there’s so little information about it. There were a few smaller downtown developments that could be considered malls by virtue of shops accessible from an interior corridor – Belleville, Stratford, and Timmins had similar small malls, but without that many stores or a major anchor. The Bayview Mall in the east end of Belleville was once a vibrant mall with a Dominion and an A&P anchoring. Century Place in downtown Belleville at one time had some major retailers like Agnew, but is now mostly Ontario government offices. I often wondered why Century Place in Belleville was not part of the downtown revitalization scheme. Century place would seem like a good place for an Eaton’s store. I can only assume downtown Belleville was still pretty healthy at the time. Indeed downtown Belleville’s slow decline seems to have starter around the early 1990’s . Growing up in Peterborough, I was surprised when I moved to Windsor that there was no similar downtown mall development. I wonder if proximity to Detroit had anything to do with it.